The brief was to help Gulf News, the UAE’s leading newspaper, reach even more readers and convert them into subscribers. Fresh news goes well with fresh coffee. So we adapted the coffee cup sleeve of Tim Hortons, a global coffee chain, into an advertising medium and we created The ‘Headline News’ Cup Sleeve. Every cup. Every hour. Every day. 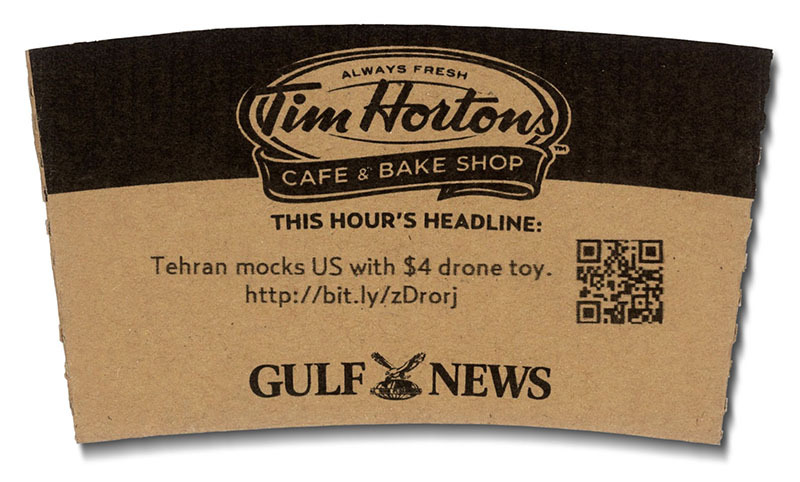 When Tim Hortons customers received a cup of coffee, they also received the headline of the hour, printed using a special printer that pulled out tweets from the Gulf News’ Twitter account. It allowed us to be the first throughout the day to deliver breaking news to potential subscribers and make a meaningful connection with them. Every Tim Hortons in the UAE now carries the Gulf News headline news cup sleeve printer. Users have the option to use the unique QR Code or short code to view the rest of the story at GulfNews.com. Until now, over 2,880 headline tweets have been printed on more than 1,680,000 coffee cups. More than 2,900 new Gulf News Twitter followers in the first two weeks of the campaign launch. To date, it has grown by more than 210%. The traffic on the Gulf News website grew by 41%. Subscription’s up by 10.8% so far. The project was rolled out in 15 Tim Hortons outlets across the UAE with more stores to open soon. The project was featured in more than 100 popular blogs and news sites such as AOL, MSN, Springwise, PSFK, Trend Hunter, Discovery News, Creativity-Online, Design Taxi, Best Ads on TV, Creative Review, DieLine, Packaging Gateway and Food Beast among others. With a small investment and no media budget, it resulted in a combined PR value of more than USD 150,000. So far, it has been shared 70,345 times on Facebook.